For October 2018, there are 3 homes for sale in Beau Rivage. List prices range from $349,888 up to $989,000 for an average list price of $572,963 or $252.49 per sq. ft. of living area. There are no homes currently under contract in Beau Rivage. In the past 12 months, 8 homes have sold in Beau Rivage. Sales prices ranged from $165,000 up to $1,150,000. The average sales price was $376,438 which equaled $197.10 per sq. ft. of living area. These homes averaged 58 days on market before going under contract and sold for an average of 96% of the last list price. Nestled along the St. Lucie River in Stuart, Beau Rivage Estates feature beautiful family homes, many with waterfront and ocean access! Imagine being able to walk out of your back door and have your 20’ weekend escape sitting in the water waiting for you! The neighborhood features homes with spacious yards and gorgeous landscaping. The homes have large bedrooms, family, and Florida rooms. Most homes even have pools! As if Beau Rivage Estates didn’t sound great already, it is also minutes away from Stuart and Jensen Beach’s hot spots such as the Treasure Coast Square Mall, along with many shopping centers, and great chain and local restaurants. ‘A’ rated schools; Jensen Beach High School, Jensen Beach Elementary school, and Felix A. Williams are all fantastic schools that are close by! 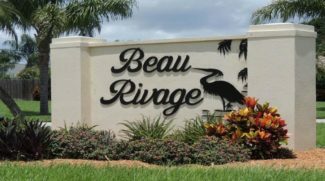 Beau Rivage Estates is actually in Saint Lucie County, but the local addresses are in Stuart, Florida and Beau Rivage residents attend Martin County schools.